In 2009 our Program began asking all our students to do small projects of community service in their own villages and towns as a way of sharing with their communities the benefits of their education. After this first year, our Administrative Committee was very pleased with the results of this new project and we decided to continue this requirement. It has not been easy since the projects have meant a whole new and time consuming task for our office staff but as you will see, it is worth the effort. This has been one of the biggest successes of our program in recent years!! Keep reading and get inspired with the work done by our students. Francisco Pellecer is a 22 year old student in the field of Agronomy at the University of “San Carlos de Guatemala”. He will complete his fourth year of studies in November of 2014. Francisco lives in Jocotenango, a suburb of Antigua. 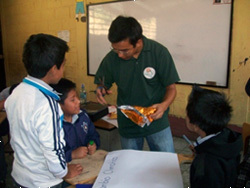 In 2013 Francisco decided to work with 4th, 5th and 6th grade students in his home community in a project focusing on environmental education and reforestation. The project included various activities including mini lectures on topics such as contamination, global warming and recycling. He then led two walking trips to a nearby protected forest area where he explained the environmental benefits provided by the trees. The final activity involved the planting of 1,400 tiny trees in an area which was owned by the municipality. The seedling trees were donated by the Ministry of Environmental and Natural Resources of Guatemala. The project also included an agreement with the municipality that they would take charge of protecting and caring for the young trees. We think this project exemplifies a very professional and complete approach to the task of helping one’s community in that it involved a number of different organizations and demonstrated Francisco’s ability to plan and carry out his vision. Mónica Ajxup is an 18 year old student from Momostenango in the department of Totonicapán. In October of 2013 she finished her high school degree with a specialty in “Communication Sciences”. 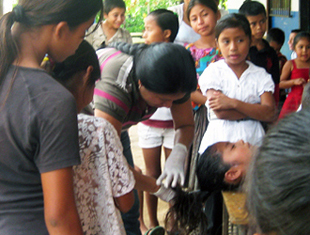 During the year Mónica completed a novel and interesting project for her community service. She tape recorded six different short radio messages aimed at informing the citizens of Momostenango about the prevalence of and problems created by alcoholism and drug addiction in their community. She then convinced seven different community radio stations to broadcast these messages for free during a campaign which lasted several weeks. At the end of each message she even credited our program indicating that “This message was brought to you by Progresa” as well as giving credit to the organization which lent her the equipment used in creating the radio spots. Mónica told us that she decided to develop this informational campaign because her community faces many problems due to the high rate of alcoholism. According to her research as many as 66% of Guatemalans suffer from some degree of alcoholism and the average age at which young people begin to drink is 15. Mónica calculated that that during the campaign approximately 30,000 people heard at least some of the radio spots. This number represents one third of the population of 90,000 who live in Momostenango and its surrounding aldeas. We thought that the level of professionalism of Mónica’s messages was so great that you might like to actually hear them. Click on this link to see the post on YouTube. Helen Montejo Montejo is a law student at the Mariano Galvez University in Huehuetenango. She lives in Jacaltenango, a small town located three hours from the University and travels to Huehue on Friday afternoons returning after her classes on Saturday. This year one of the middle school students in her town committed suicide as a result of problems he was facing at home. This unfortunate incident resulted in a very tense situation in the school and many of the students reacted by acting out and becoming more rebellious. Working with the school principal Helen decided to offer workshops which focused on the prevention of bullying and family violence as well as the transmission of values and the building of self esteem. She offered workshops to several different groups of students at the school. Using her knowledge as a law student, one of topics she emphasized was the Guatemalan laws which are designed to protect adolescents and the institutions to which they can turn if they suffer some type of violence. An important part of the workshops involved teaching students about how to resolve conflicts with alternatives to violence. As a final project activity, Helen organized a student march through the streets of Jacaltenango where the students carried placards with messages encouraging their fellow citizens to avoid violence and create positive values. Although most of our students complete their community service projects in their home villages, Milton Rocael received permission to do his service in Guatemala City where he both studies and works. The project took place in a Catholic school which provides classes in reading, mathematics, writing and music for children, young people, and adults. After learning that many of the school’s desks were broken and in bad repair, Milton made an appointment with the director, Padre Wenceslao Mazariegos . Milton explained his idea and together they visited all the classrooms and lecture halls and determined that a total of 50 desks had problems needing repair. Since Milton has a full time job six days per week as well as full time studies five evenings per week, he had very little free time to complete his service project. As a consequence he decided to use his mid-year vacation to do the work. With the help of the Progresa personnel he developed a plan and presented it to Padre Wenceslao. Once the project was approved he began work on Monday, January 20, 2013 and finished six days later after working eight hours a day for the entire week. At his high school, “Villa de lost Niños”, Milton had studied both woodworking and metalwork as well as the standard academic classes so he was able to replace damaged wood and solder broken metal pieces as well as sand, paint and varnish the 50 broken desks. Milton’s goal was to provide the students and the community with a safe and clean learning environment. He felt that learning was easier and more fun in comfortable surroundings and he estimates that approximately a hundred different individuals benefited from his work. Milton felt very proud of the service work he provided and was happy that he was able to help the school and its students. Padre Wenceslao was so pleased with the outcome that he called us at the Progresa office to thank us and rave about Milton’s good work. Jesús Aniceto Veláquez comes from the municipality of Tacana, San Marcos, located in the far western part of the country, 323 kilometers from the capital. He recently finished his community service project which he titled “My Community is Green”. He gave workshops in his community for both young people and adults which focused on protecting and improving the environment. Along with members of the community he created a nursery of 4,000 trees which will now be replanted on a piece of land owned by the community. The major purpose of the workshop was to increase awareness of the appropriate use of water and the need to moderate the cutting of trees. He also discussed the preservation of soil and other natural sources while at the same time using these resources to generate income.